Panelists included Tanaya Bhowmick, MD, assistant professor of medicine, Robert Wood Johnson Medical School; Debbie McCluskey, RN, nurse manager, Rutgers Clinical Research Center; Estela Jacinto, PhD, associate professor of biochemistry and molecular biology, Robert Wood Johnson Medical School; Valerie Fitzhugh, MD, associate professor of pathology and laboratory medicine, New Jersey Medical School; Karen Akinsanya, PhD, clinical pharmacology, discovery research and business development, Merck & Co Inc.; and Ina Nikolaeva, PhD, senior medical writer, ClinicalThinking. Women make up half the world’s population, yet the number of women with careers in science is not commensurate. Stereotypes and gender biases are among historic and ongoing factors in this imbalance. Despite significant strides, women playing important roles in science continue to face challenges even today; however, there is an upward trend as more women are graduating with undergraduate and graduate degrees in science. 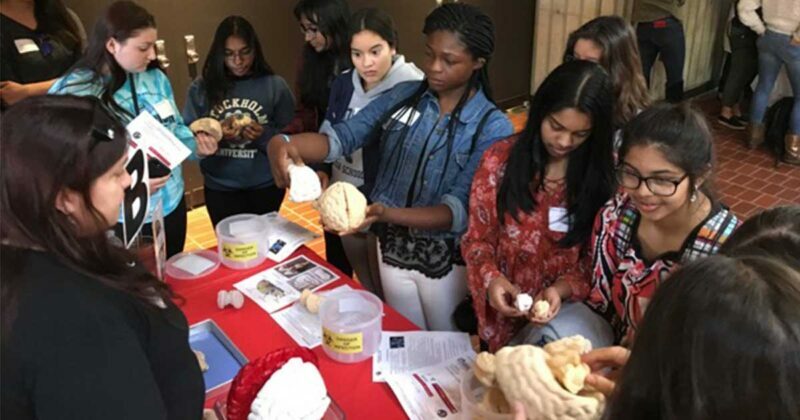 This progress is, at least in part, a result of the paths charted by pioneering women in the field and inspirational programs like those offered by Young Women in Bio. 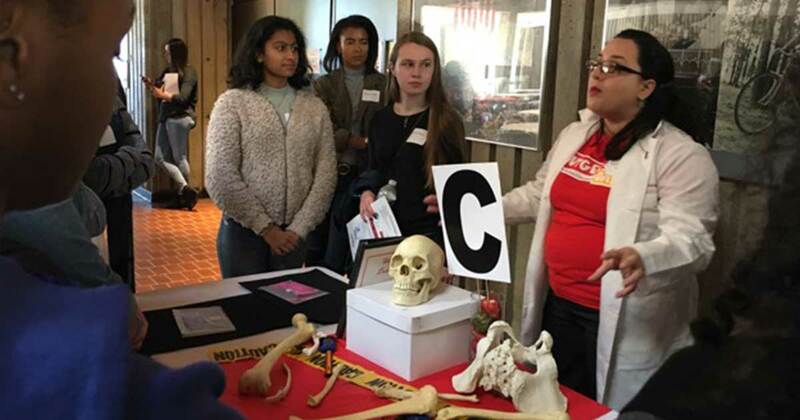 A recent event called “Curious About Careers in Biomedical STEM” organized under the aegis of Young Women in Bio in New Jersey brought nearly 300 high school girls together on the campus of Robert Wood Johnson Medical School for a day-long introduction to careers in the biological sciences. Co-sponsored by several scientific organizations, the conference featured a panel of fascinating role models (all women, of course! ), as well as hands-on learning exhibits covering various topics in bioscience. Each panelist shared her personal journey, detailing factors that influenced her to pursue a science career and as well as obstacles that had to be overcome. By the end of the day, the program evoked a sense of pride and unity among the young women who had gathered and opened their eyes to a variety of avenues and opportunities in the field of biological science. Even after overcoming initial obstacles, success is not a given — one has to be creative, vigilant, and assertive. Dr. Jacinto recalled the importance of “seizing every opportunity.” As an average student, she felt medical school was not an option for her. She explored various avenues in sciences. Ultimately, her work as a greenhouse technician gave her the first opportunity in research. After that there was no looking back. She eventually worked her way up to become a principal investigator and assistant professor at the Robert Wood Johnson School of Medicine. For several panelists, inspiration to pursue a career in investigative medical research was spurred by unfortunate circumstances. Karen Akinsanya, PhD, was deeply affected by her father’s illness. She wanted to make a change in the world and went into research. Currently, she is a “drug hunter” who searches for novel software- and technology-based therapies to fight disease. Dr. Jacinto gravitated towards medical research when her daughter developed leukemia. Some women are inspired to pursue science at an early age. Take for example, Deborah McCloskey, RN, who knew she wanted to make a career in medicine from the age of 17. She currently conducts clinical trials in the field of rare and orphan diseases at a major NJ hospital. The message from the panelists was clear. Be motivated, pursue your dreams and be flexible. Opportunities for women in STEM fields are growing. The inspiring stories of the panelists left us with the confidence that there are many new pathways for women to chart in the field of biomedical STEM. Women already make up more than 50% of degrees earned in biology, even at the PhD level. 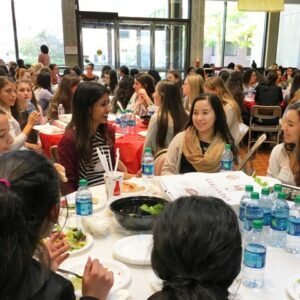 The challenge is to get more women into physical science and computer science.